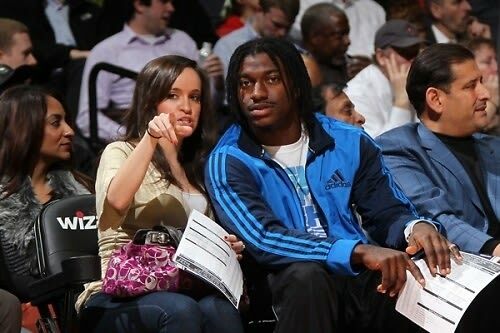 On Monday night, sensational Redskins quarterback Robert Griffin III took court side seats with his fiancée, Rebecca Liddicoat, at the Wizards v. Miami Heat game. Rebecca and Robert met at Baylor, and he proposed in 2010, according to the Reliable Source. He wore head-to-toe Adidas, and she was conservatively dressed but still toting that hot pink Coach purse. Apparently there are no wedding plans yet. That night, the Wizards beat the Heat, 105-101.